RabbetSpace secures the art and finish off the back of the frame quickly, easily, and neatly. RabbetSpace is a neutral pH plastic rabbet depth extender used on the back of wood picture frames to extend the depth of shallow rabbets. 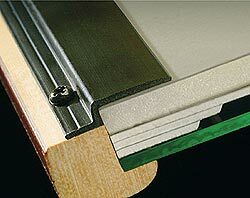 This comes in handy when doing "Spacer Framing" in ready-made frames as the rabbets are usually too shallow to accept the combined thickness of the glass, mats, spacer, and backing. RabbetSpace is easily screwed to the back of the frame and comes in 4 sizes from 1/8 inch to 1/2 inch extensions. The industry's only pro-fessional-looking rabbet depth extender system. It's the perfect solution for too-shallow rabbets. Use black mat board or black foam board as the last layer in the frame for a professional-looking package. Click here to read RabbetSpace instructions and tips for using. Wood spacers strips to support Rabbetspace in chopper or saw - all four sizes about 10" long. Special Rabbetspace 1/4" hex drive drill bit. Drills the perfect diameter and depth pilot holes and clearance holes for the screws. Stops at the right depth. You can't drill too deep. Special long-reach size #1 x 1/4" hex drive Phillips driver bit. Long enough to reach even as deep as RS 1/2. 100 extra #2 x1/4" (Teeny) black plated screws.